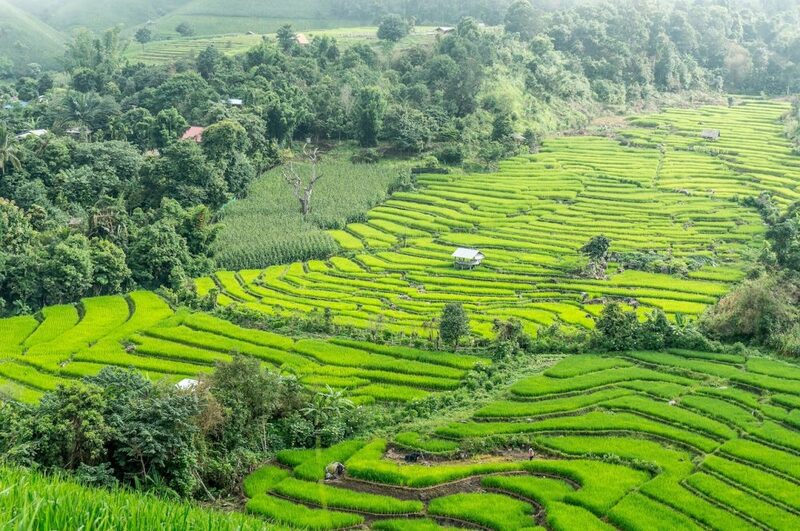 The blissfully calm and laid-back capital of the North, Chiang Mai never fails to charm visitors with its mountainous landscape and lush farmlands. Formerly the capital of the glorious northern kingdom Lanna, the city still carries with it today a great number of cultural heritages. At the same time, Chiang Mai Old City features not only traditional art and craft workshops but also tasty food scene and trendy cafés. With millions of visitors every year, what do they come to Chiang Mai for? Let’s discover what the charming northern city can give you. Search “Chiang Mai” in Google and endless photos of temples will pop up. You can’t miss a chance to visit the city’s most famous temple, Wat Phra That Doi Suthep, which is a beautiful mountaintop temple. If you’re up for an adventure, you can even hike to the temple and drop by Wat Pha Lat, a hidden forest temple on the way. In the Old City area, there are lots of other unique temples for you to visit. From Wat Phra Singh and its teakwood structure and Wat Chedi Luang with its enormous ancient pagoda to the Silver Temple (Wat Sri Suphan) and many more, each temple has its own rich history. If you want to immerse in Buddhism even more, you can even join a meditation session with monks. 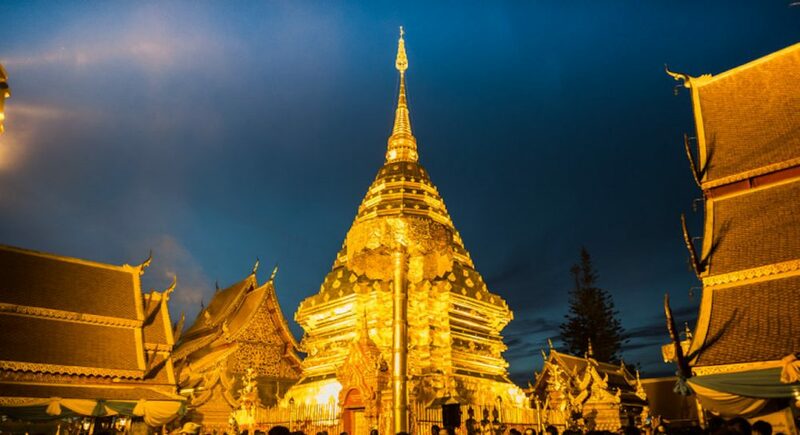 Book a Wat Phra That Doi Suthep and Chiang Mai Temple Tour. Love elephants? Instead of riding them, show them your love by visiting an ethical elephant sanctuary in a jungle and take care of them instead. Help elephants take a bath, prepare food for them… treat them as your friends! A cruelty-free encounter lets you get even closer to the elephants and it’s the best thing you can do for them. Book an Elephant Care Experience. Coming to the mountainous North without visiting Thailand’s highest peak feels incomplete. At 2,565 meters above sea level, you get to enjoy a panoramic view of the breathtaking natural landscape. En route to the top, you can also stop at other beautiful attractions in Doi Inthanon National Park area like Wachirathan Waterfall, hill tribe market and the twin pagodas. It’s best to tour the national park with a car as some places aren’t easily accessible. For those who want more difficulty, consider climbing Mount Chiang Dao. The limestone mountain is still pretty much under-the-radar and you can enjoy both the adrenaline rush and the solitude. Book a Doi Inthanon Trekking Tour. Imagine yourself climbing a unique, hidden waterfall and taking a good shot of yourself surrounded by greenery. Wouldn’t that be super cool? 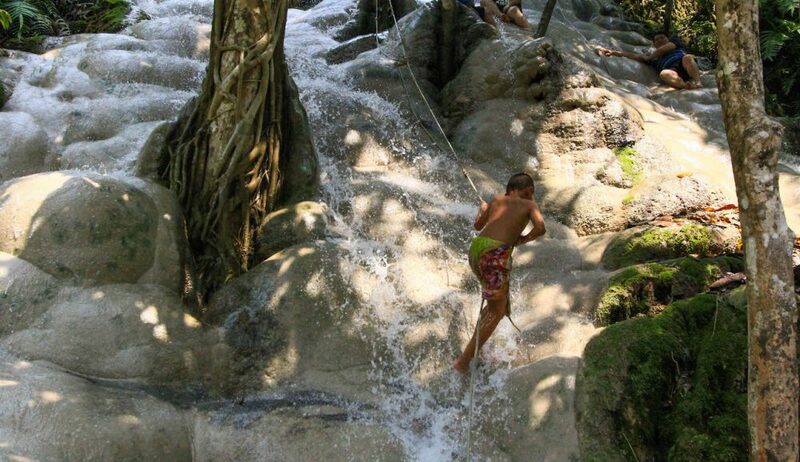 Bua Tong Waterfall or the Sticky Waterfall is an unusual limestone waterfall. Thanks to its sticky surface, you can actually “climb” it. Don’t be afraid and go off the beaten path for the fall. Although requiring a few hours’ drive, it’s worth a visit! Book a Sticky Waterfall Tour. Street food is a huge part of Thai culture and Chiang Mai is not an exception. 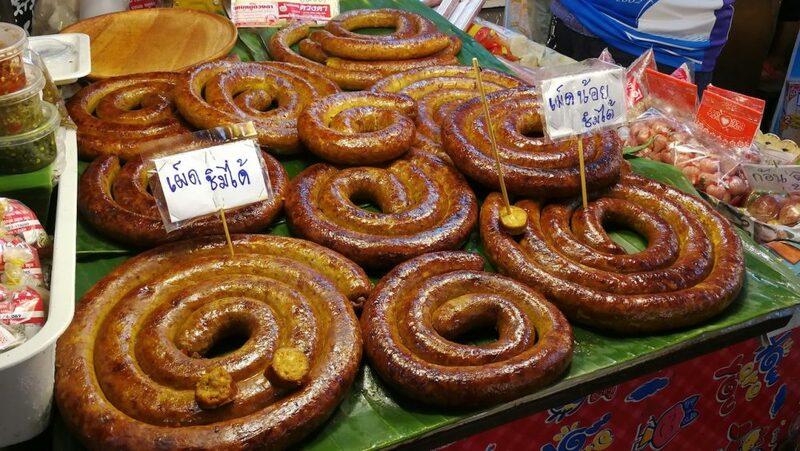 In the Old City especially around Tha Phae Gate and Chiang Mai Gate, hundreds of hawkers and stalls are set up at night and visitors can find both modern and traditional Lanna food. Sai Oua (northern Thai sausage), Nam Prik Noom (roasted chili dip), Nam Prik Ong (tomato chili dip) and Cap Mhoo (fried pork skin) are Chiang Mai’s most well-known specialties. There are a lot more to northern Thai food, though. If you’re feeling adventurous and looking for exotic stuff, visit local markets such as Kaad Ngua or Cattle Market. The weekend market started as a place to sell cattles, but now it has become a market for many things including local Lanna food. Book a Chiang Mai Street Food Tour. Just like anywhere else, Chiang Mai’s most wonderful meals are made at home. To get a glimpse of authentic local food culture, many locals open their houses for you to come join their lovely cooking session and dine with them. 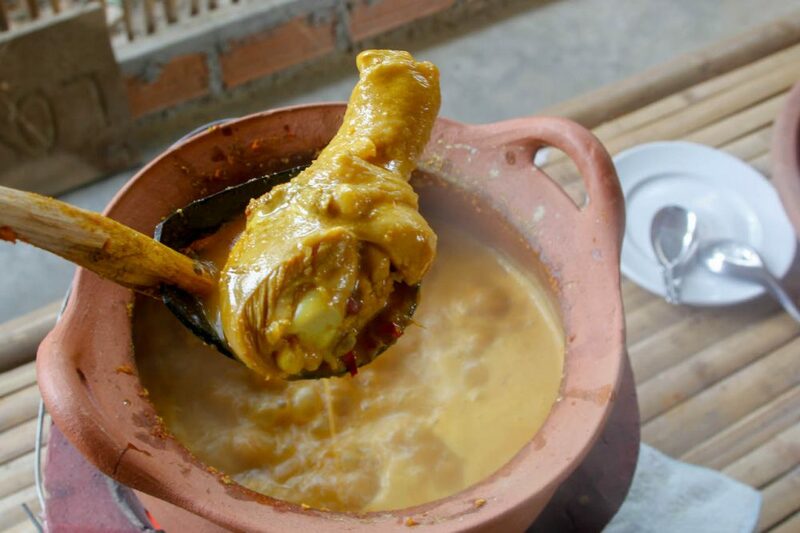 Learn about the local ingredients such as Jin Som (fermented meat), Hom Daeng (red onion) and Nor Mai (bamboo shoot) and how local food has come to be. Book a Lanna Cooking Experience. Chiang Mai is blessed with plenty of not only mountains but also rivers and streams. 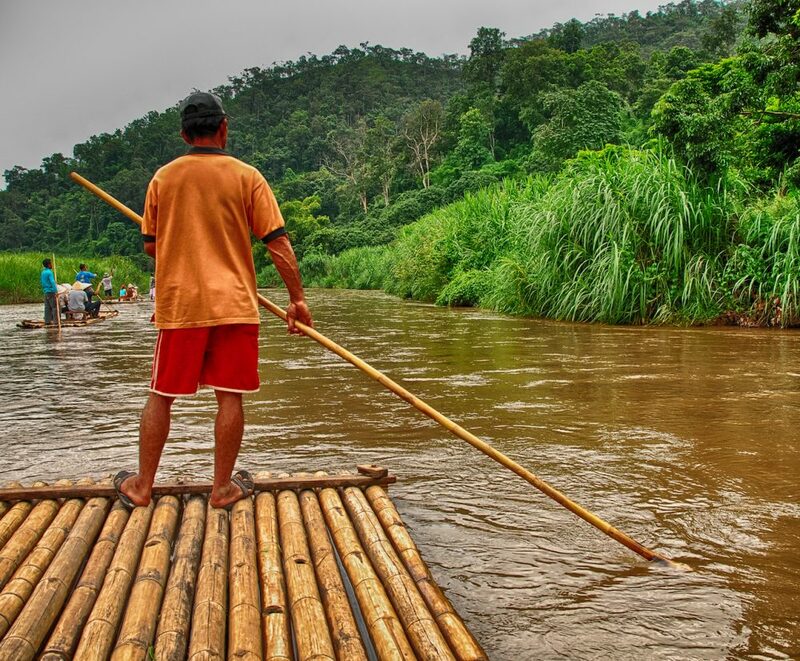 Made from a local product like bamboos, the raft enables you to experience a fun and unique adventure right here in Chiang Mai. Get your adrenaline pumping while enjoying the refreshing stream. Book a Pha Chor National Park Tour and Bamboo Rafting Experience. 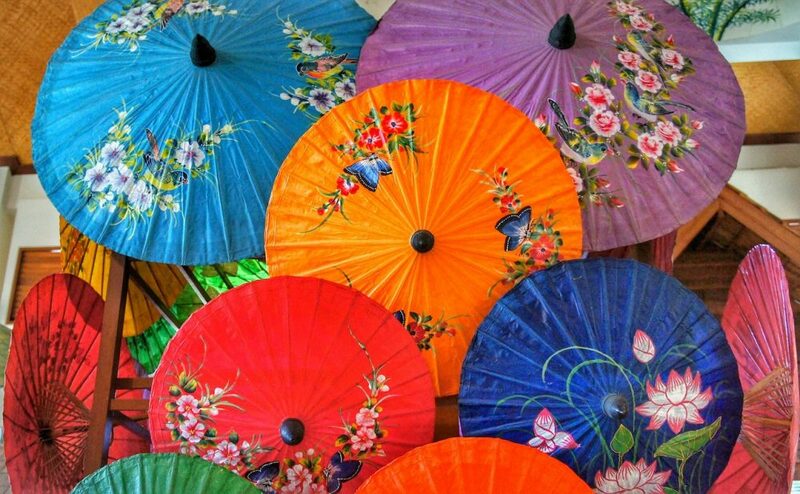 Chiang Mai is a city of art with various art and craft workshops for you to try. Craft a paper umbrella or make your own doll. Make your own t-shirt in a natural dye workshop or paint your own the Khon mask with a local artisan. It’s definitely one of the best places to get artistic. Book a Bo Sang Umbrella Village and Sankampaeng Hot Spring Tour with Food Tasting. Besides the popular attractions, Chiang Mai offers a lot of getaways full of idyllic beauty. Spend a few days in the local villages and do as the locals do. Visit local homes and talk to the friendly villagers, ride a bike along rice paddies or even picnic in nature. We highly recommend Mae Taeng and Mae Kampong. Book a Mae Taeng Cycling Tour with Farm Visit and Picnic with a Local Family. 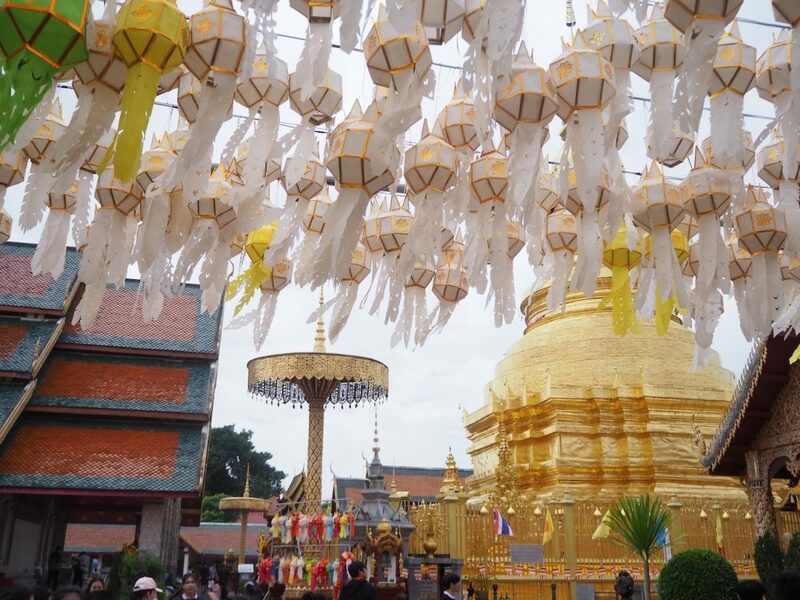 Chiang Rai Old City is the place to be for temple lovers. However, the further flung temples are even more unmissable. 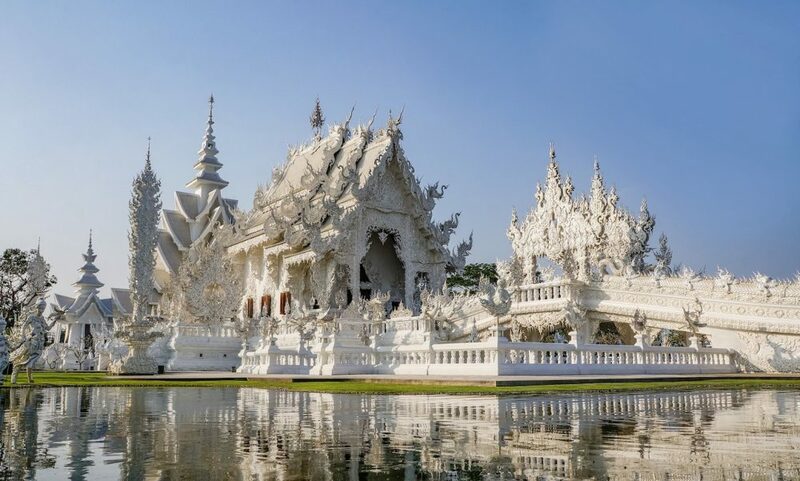 The heaven-like White Temple (Wat Rong Khun) has been garnering attention, but there are also the darker Black House (Baan Dam Museum) and the otherworldly Blue Temple (Wat Rong Seua Ten). Chiang Rai is also a paradise for teaholics. Taste top-notch green tea and desserts at Choui Fong Tea Plantation, but if you don’t drink green tea, you should still go for the tea plantation view. For more wonderful views with an insight into local agriculture, visit Singha Park. 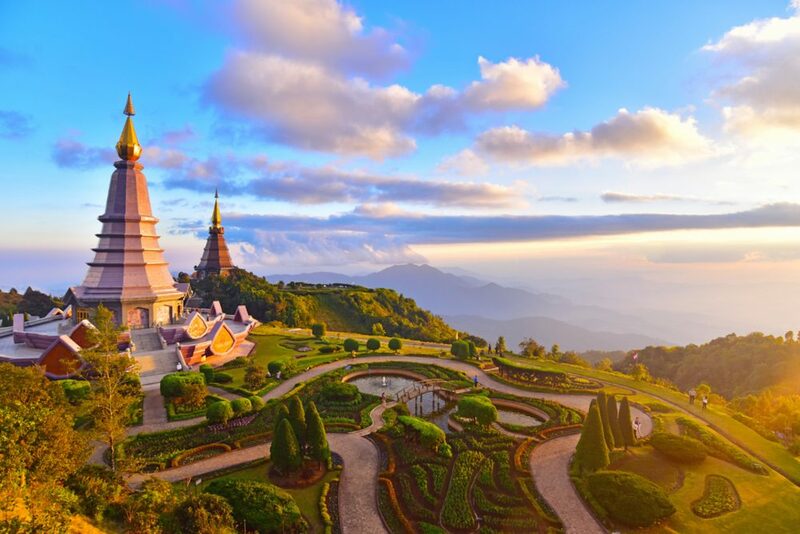 Book a Chiang Rai Top Temple Tour. It’s as if time stood still in Lampang. The old town area is dotted with not only Lanna-style but also Burmese-style temples. Its walking street and old market are some of the most charming in Thailand. While temples are the essentials on Northern Thailand itinerary and some of you might feel templed out at some point, you still wouldn’t want to miss a 4WD ride to see the white pagodas of Wat Phra Bat Pupha Daeng decorating the rocky mountains. If you need more nature, Lampang is also rich in caves and waterfalls. 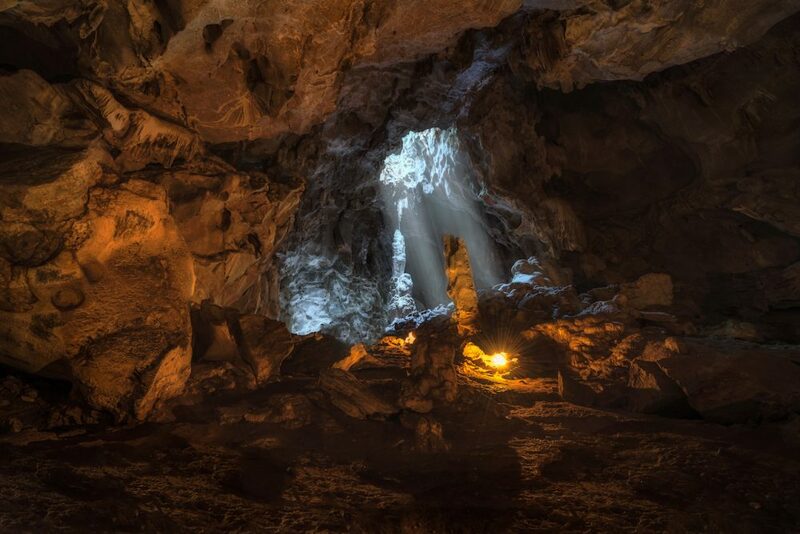 Book a Lampang Waterfall and Cave Tour . Older than Chiang Mai by about 600 years, Lamphun is a great place to enjoy more ancient temples but with much less tourists. Flourished by Queen Camadevi’s visionary mind, the city offers you a chance to experience a unique slice of Thai history. Khun Tan Tunnel, the longest railway tunnel in Thailand, is also in Lamphun. TakeMeTour is Thailand’s largest online marketplace for private 1-day trips by Local Experts. Discover famous destinations, hidden gems and unique experiences in over 50 cities in Thailand at your fingertips. Find tickets for attractions, car rentals with personal drivers, airport transfers and other travel products at special prices. Come and see Thailand through the eyes of the locals, all hassle-free! Departing :Departing Date This is the calendar component, Please Select Departure Date. For navigation you may use the arrow keys to select a day. Using esc key the component can be closed. Returning :Returning Date This is the calendar component, Please Select Return Date. For navigation you may use the arrow keys to select a day. Using esc key the component can be closed. Promotion Code :This field is optional field.